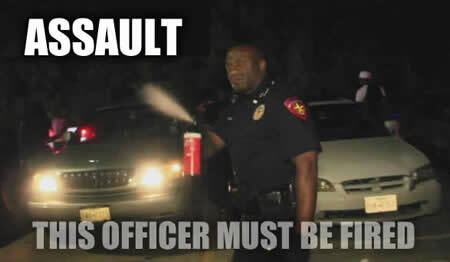 Waller, TX — A Waller police officer is on paid leave after pepper spraying a college student for filming him. Bobby Hall is a mass communications major at Prairie View A&M and always has his camera on him. When he heard a large disturbance outside of his home in Meadows Apartments near Prairie View, he grabbed his camera and went to record. “Yeah, it’s what I do. I’m a mass communication major here at our school,” Hall told Eyewitness News. That is when officer Adophus Cannon came on the scene and pepper sprayed Hall for no reason. “It just started burning my face. It was burning,” Hall said. After pepper spraying the innocent bystander, and realizing that the video could be damaging, Cannon allegedly tried to negotiate with him. Hall says Cannon told him he would let him go if he promised not to release the video. Obviously Hall did not take Cannon up on his offer. We became aware of a video in which one of our officers may have used pepper spray during an encounter with a civilian. We are currently reviewing this incident to determine the officer’s compliance with standard operating procedures. The officer has been placed on administrative leave pending the outcome of our review. “I think he should lose his job. I feel like I didn’t do anything wrong. I was just using my First Amendment Right. I feel like he was abusing his authority,” Hall said. Unfortunately police pepper spraying videographers is not rare. Just last weekend, Jason Bassler and Cassandra Rules of the Free Thought Project were covering the recent protests in Ferguson when they were pepper sprayed for filming the police. The very next night, Free Thought Project video live streamer, Rebelutionary_z was hit in the face with pepper spray while filming police beating non-violent protesters.